JOIN THE COYOTE COMMUNICATION ARMY IN FACEBOOK!!!! 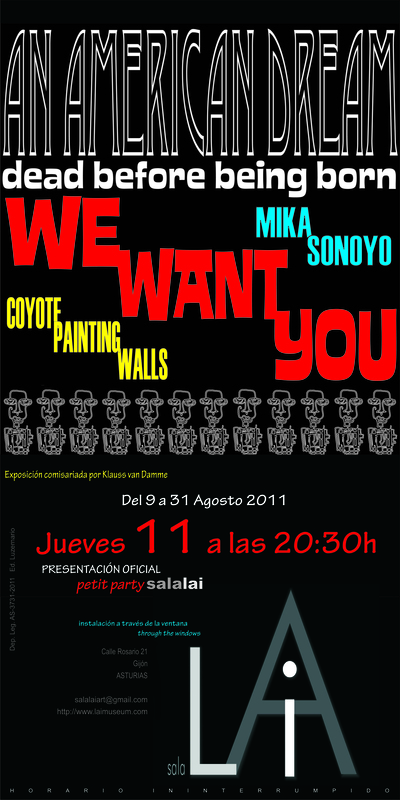 Coyote Painting Walls and the japanese artist Mika Sonoyo are working in the show An American Dream that will be presented in Sala LAI (Gijon, Asturias, Spain) on August 11 and will remain in the gallery untill the end of the month. An American Dream is a collection of illustrations by Coyote and some pictures by Mika Sonoyo. Hope to see you in the opening!!!! !